“We recognize water as a living system. It means life. In ceremony, water is an everpresent power and so we seek to harmonize human consciousness with the consciousness of the Creature-Universe. Water can’t be reduced to hydrogen and oxygen bonds; it’s intimately linked to vegetable life and astral phemonena. We speak to water, we have conversations with it, we caress it; we trasmit our happiness and our sadness to it. Everyone knows that water thinks, feels, reflects, cries, and can be saddened.” This is how Dr. Daniel Matul, president of the Guatemala Maya League, explains what water is in Maya consciousness. Water is life, a gift that falls from the sky, that nourishes the fields and rivers, gives life to our harvests and to us. Nature is a totality. It is movement and action, it’s the soil, mountains, trees, birds, clouds, fire, water, lakes, and, no more and no less, man, together in a single living system. Each part is sacred and fulfills a role. Water, air, sun, and earth are the elements that make up man himself and so it is so important to show them due respect. 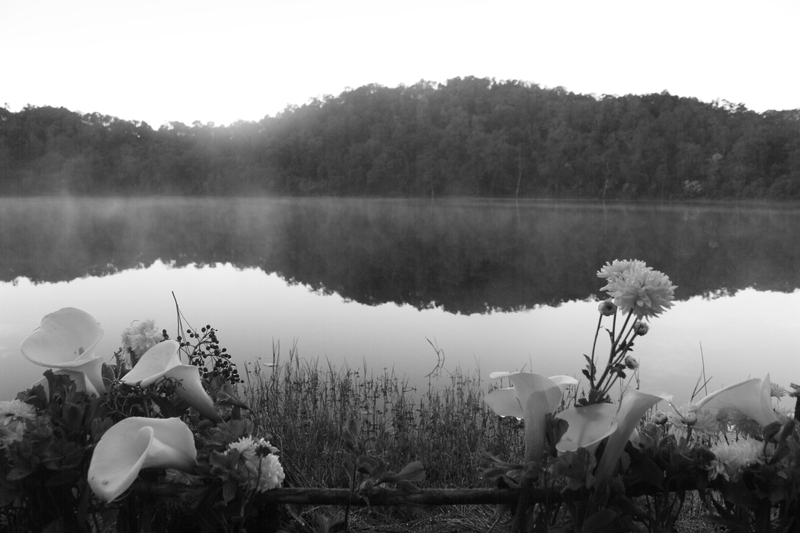 A floral offering on Lake Chicabal in San Martín Sacatepequez, Quetzaltenango. Photo by Patricia Macías. Some of the nearby sacred water places are: Laguna Chicabal in San Martín Sacatepéquez, in Sololá Lake Atitlán (Atit: Grandmother and Tlan: Water; “Grandmother of Water”), and near Guatemala City Lake Amatitlán (Amat: Abuelo and Titlan: Water; “Grandfather of Water”). Water is also fundamentally important to the Maya underworld. The movement of underground waters, so evident in a country of volcanos and hot springs, forms part of a sacred system that is invisible and holds invaluable secrets. Caves and tunnels are so significant in Maya symbology because it is through them that this other world of secret movement and life can be explored. There are innumerable written and architectural references that speak to us about the meaning and concept of water in the Maya world. These references speak of the element as creation’s momentum, present in all living beings, and as a dynamic, fertile female form. The graphic that appears below is an example. In the upper half of each image is a serpent, the spirit or nawal of water. The pieces on either side of the central image also represent water, sometimes stylized as the fins of fish, sometimes stylized as fish themselves, as in the central glyph. 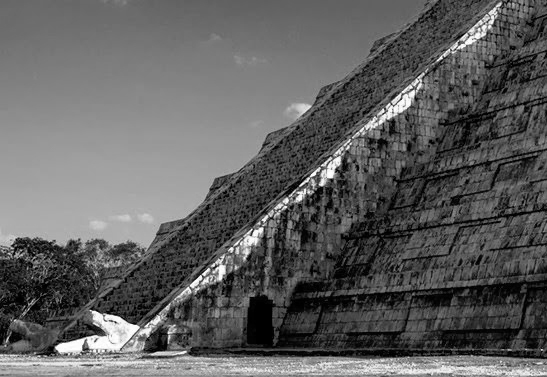 The temple of Chichen Itzá, in Mexico, is completely dedicated to water, as the serpent on its walls testifies. When the winter and summer solstices arrive, the sun’s reflection on the building creates shadows that mimic the movement of a serpent, symbolizing the descent of water from the sky to the earth. Carved Maya designs with water symbolism. Courtesy of Dr. Daniel Matul. The shape of a serpent illuminated by the sun on a temple at Chichen Itza, Mexico.